The TYNE COT MEMORIAL to the Missing is one of four such memorials in Belgian Flanders, covering the area known as the Ypres Salient. 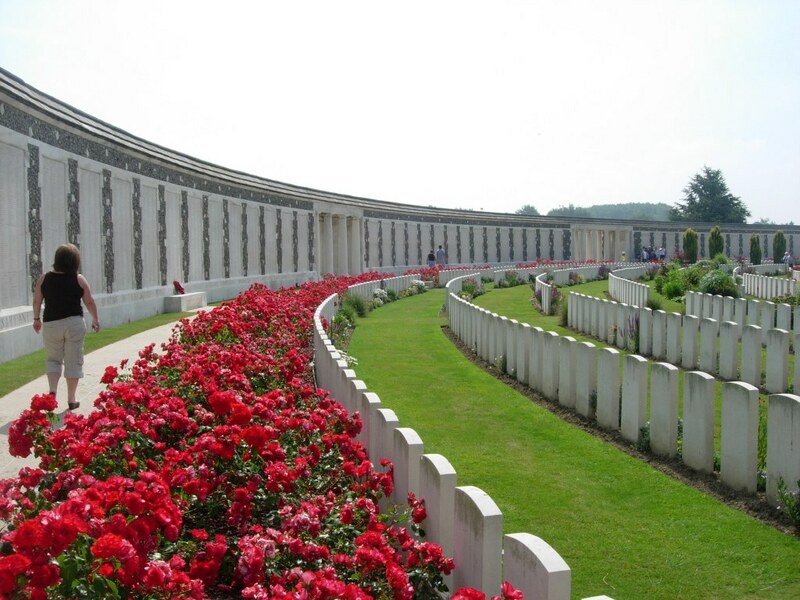 Tyne Cot marks the furthest point reached by Commonwealth troops until nearly the end of the war. The Tyne Cot cemetery (of which the memorial forms one boundary) surrounds a large captured German pill-box used as an advanced dressing station, upon which the Cross of Sacrifice is placed (at the suggestion of King George V on his visit in 1922). There are three other pill-boxes in the cemetery. The Memorial bears the names of almost 35,000 officers and men whose graves are not known. Designed by Sir Herbert Baker with sculpture by Joseph Armitage and F.V. Blundstone, it was unveiled by Sir Gilbert Dyett on 20 June 1927. The names are inscribed on vertical Panels, clearly visible in the photograph, where the Fallen are listed by regiment and rank.